It’s been only four years since Vanessa Peters first toured the Netherlands. A suitcase, a backpack and a guitar and racing all over the Netherlands in public transport with Alex Akela supporting on bass, mandolin and violin. That was also the year that inspired ‘Drowning in Amsterdam’ as it rained for the whole duration she was here. 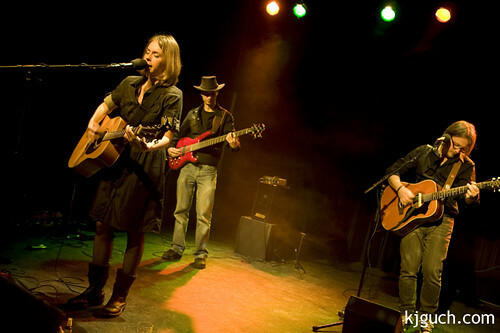 After the theater gig in Zwolle, Vanessa and band traveled to Assen for their next gig in De Witte Bal. A quick stop at my house and then off to the venue for soundcheck and dinner. The gig started at half past eight. Unfortunately the café wasn’t nearly full and with most people in the rear of the café it almost felt like a private gig for me. It’s been about three years since I first saw Vanessa Peters. In May 2007 I was asked by Fileunder if I’d like to go and see a singer/songwriter from Texas/America who was on her first Dutch tour. 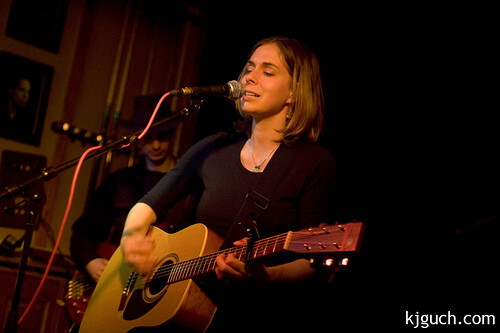 She played in a small pub in Groningen. No stage, only two lightbulbs above her and an audience that barely paid attention. But Vanessa didn’t let that get her down and was back for a tour half a year later, playing small venues and bringing Italian Manuel Schicchi from Icecream on Monday along with her for support on guitar and Dutch Alex Akela on bass, mandolin and violon. Currently Vanessa is seen as one of the most influential Texan singer/songwriters of the moment and is back for another tour through the Netherlands. Again with Manuel and Alex and on Friday April 16th the band played in the Papenstraatheater in Zwolle. For me a first for the venue and finally back in Zwolle as it’s been a long while I was there. I was very happy to see the small theater filled up very well. Theaters usually mean a more attentive audience then bars. It also meant that I’d have to be a lot more sensitive with my camera (the Canon tends to sound like a cannon when it’s surroundings are silent). So I took an absolute minimum of images.